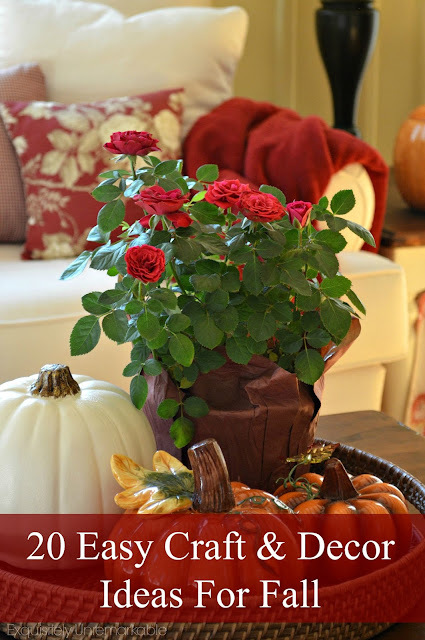 Decorate your cottage for fall with a few roses, crafts and natural elements. Come take the tour and get some inspiration! Hello friends! Well, despite my best efforts to hold on to summer, it looks like Mother Nature's generosity ended this weekend. My extended week of warmth and 90 degree temps is over and the fall chill has rolled on in. Perhaps she knew that I was participating my friend Kristi's Welcome Home Fall Tour today and I needed a little motivation to dress my house for autumn. Or perhaps it was just time. I mean it is October ~ this little beach cottage needs to snuggle up and get cozy. It's a season my home wears well and I'm excited to share it. I have to be honest, each year, I seem to put out less and less. Last fall, I spent $10 on a few tiny white pumpkins and used what I had in my shrinking seasonal bin to decorate. This year, I spent a total of three bucks at the dollar store and it's all about the roses. They have been on sale for several weeks at my grocery store for $4 a bunch and I haven't been able to resist their romantic lure. While they aren't my beloved tulips, their colors are intoxicating and coupled with a few of my latests crafts, they fit my cottage style perfectly. My thrift store cutting boards have taken center stage in the kitchen. I can't seem to get enough of them, so I move them around frequently. They have become favorites. I may have to make more. There are no pumpkins in the room just yet. Like a I said, it's been in the 90s, definitely not pumpkin patch weather. Until we get the urge to hit the farm, the apples and pears take center stage. With all that bold color going on in the kitchen, I decided to step away from the deep reds and oranges that I'm usually drawn to and went for a softer look in the living room. I took my cue from another bargain bunch of roses. If you peek into the room, you'll see that while I put my red curtains and pillows back after a summer of white and light, I opted for muted accessories to ease into fall. Again, I just added a few new crafty pieces to set the tone and let the roses take center stage. They seem to soften the beams on the ceiling and the stone fireplace. The crafts were simple, my recycled ceiling fan blades welcome you into the room. I also painted three dollar store pumpkins white, I made a banner, big surprise, and I "aged" two crates I found at the curb. Tutorials are on the way. And still very, very fall. I guess I'll have to get used it, huh? Hey ~ now it's time to hop! Next stop is Atta Girl Says. Be sure to check out all the pretty from Amy and the other talented ladies. Beautiful and perfectly fall Kim! 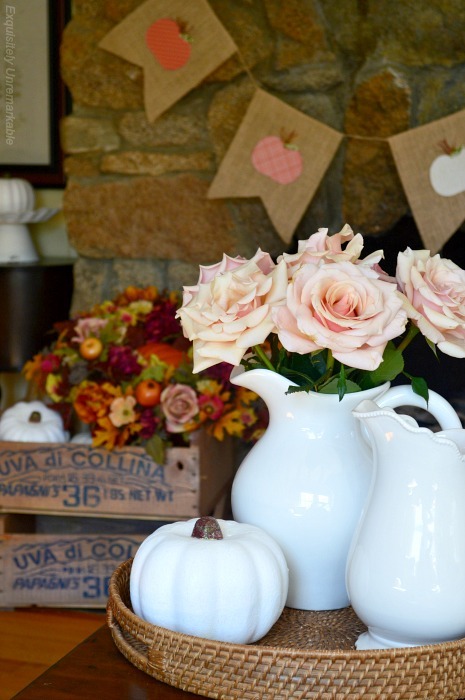 Love your simple fall touches in your pretty cottage, and those crates are awesome! 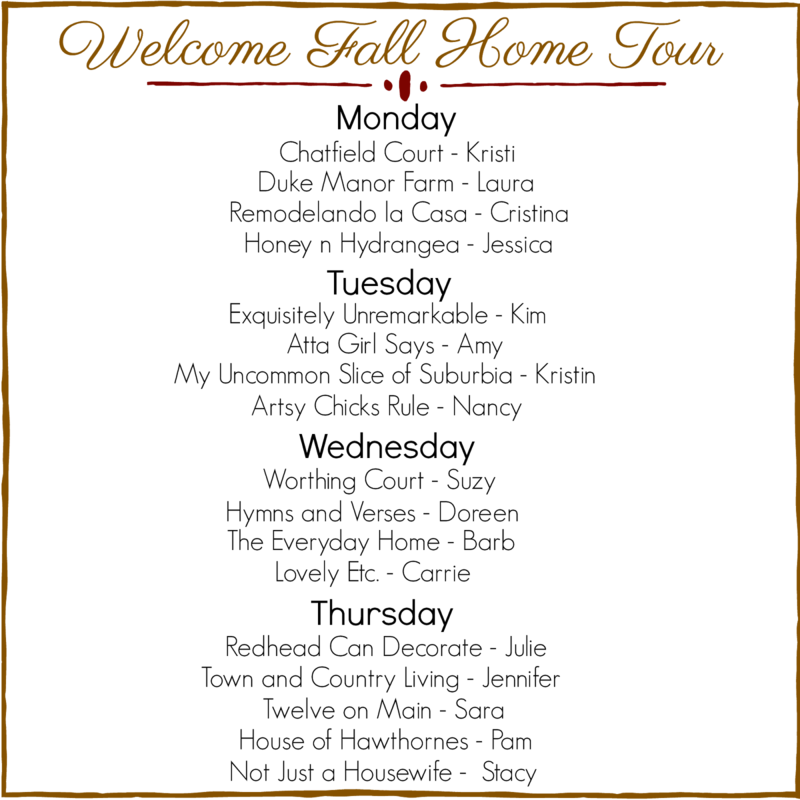 Thanks so much for opening up your home and being a part of my fall tour. Thanks so much! It was truly my pleasure and thanks for including me, Kristi! I like your arrangements in the kitchen and family room. That was a great idea with the cutting board. As the years go by I also put out less decorations. I use to decorate every room in the home, but now it is the living room and dining room. Less becomes more at my house, too. Unless, of course, you're talking about the dining table and buffet! And then it's an overload of fall colors! My last move, I inadvertantly got rid of some great ceramic pieces, so my usual display on the tv cabinet will be toned down. That, and I'm waiting for a complete rewire of my house, so not getting much put up yet. Your crates are wonderful!! Would that I could find something so nice on the side of the road! I'll make a few more fabric pumpkins, though, and hopefully a wall hanging (or shower curtain!) That I bought the fabric for in 2010!! Who knows, it might even become a quilt top, depending, of courese, if it ever gets started...! 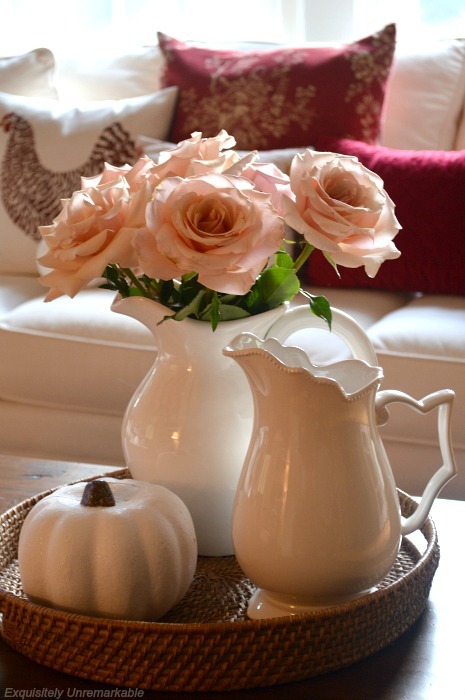 Love your pretty Fall decor! I think you can never go wrong with roses, they're adorable. And I couldn't keep my eyes off those fan blade signs and crates, beautiful! Thank you so much, Cristina! The roses have been such a bargain I haven't been able to resist...and the other items are presents from the curb. Gotta love garbage night! Thanks for the visit. The roses are stunning!!! What a perfect way to transition into fall. Love your fall touches, especially those crates!! Those crates make me smile every time I pass that room, Jessica. It's amazing what makes me happy...and thanks! Love it all Kim. 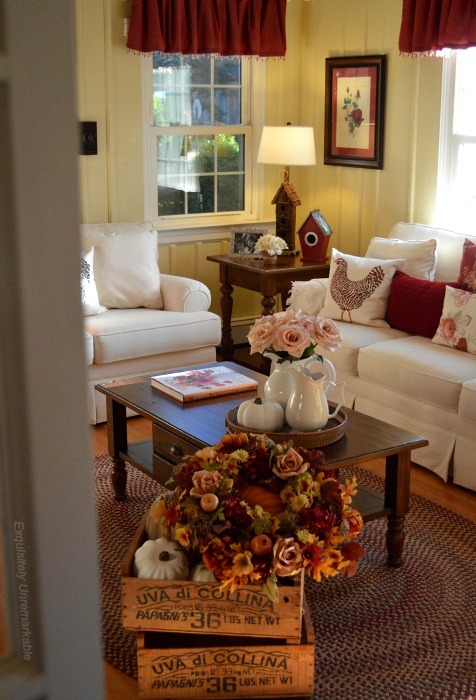 Your cottage looks so cozy and pretty for fall to arrive. We are finally getting fall here in Illinois too. So I guess it is good bye to summer and hello Fall. Still love those cute fan blades. You go girl with your cleverness! Love your flowers! What a pretty transition into fall. I still haven't gotten out any seasonal decor. I blame appliance-gate for that. Ha! I should have all my deliveries soon and then I can concentrate on bringing out the pumpkins. Fingers crossed! Thank you, Lisa! Simple is the name of my game...and I hope those appliances show up and behave soon. I seriously think I love your home every bit as much as my own, Kim!! I could settle right into your sweet cozy home and feel....well, right at HOME!! Love all the roses, at first I thought they were out of your garden....hey at $4 a bunch I'd be filling my house also! My market never has any decent flowers, too bad. You are the sweetest, Debbie, thank you, and if I could grow them, I would. Unfortunately, my thumb is not nearly as green as yours...so the grocery store it is. Everything is just gorgeous and I love those pops of red, your cottage is so welcoming! Kim your home is lovely and you have not gone over the top! Simple understated elegance! Simple understated elegance? That is the best compliment I could ever receive, Mary. Thank you! All of your fall accents are cozy and charming. I'm envious of your curbside find--those crates are awesome! Thanks so much, Cecilia! I am pretty smitten with those crates, too. It's not about how many things you add for the season. It's about how the things make you feel! Right? It doesn't always take a bunch to make you feel snuggly and fallish. I love your fall touches. Absolutely! Less is more as long as it makes you feel good! Such a pretty home you have. Its filled with love and warmth, pinned it too. The temps finally dipped this weekend, Deb, but to be honest, it still is quite warm. So the pumpkins will have to wait! 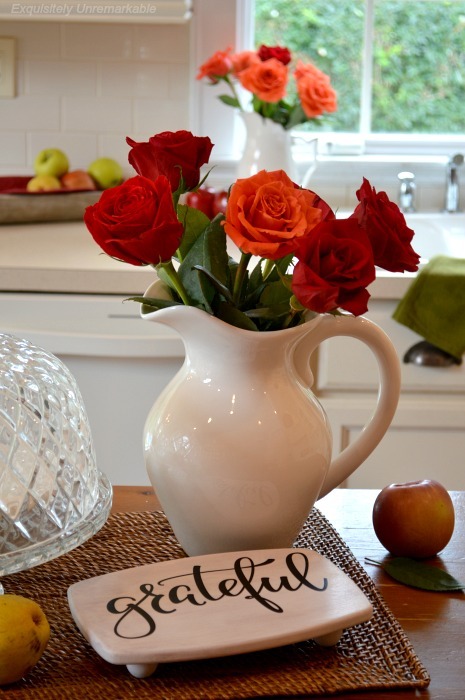 The roses are beautiful and go so well with your fall decor! kim,what a creative idea using the fan blades. how fun is that. love the way your beautiful roses are ushering in the fall season. Thanks Laura! I'm not handy with power tools, so I figured this was an easy way to get that "tag" look. Thanks for the visit, enjoy the week! 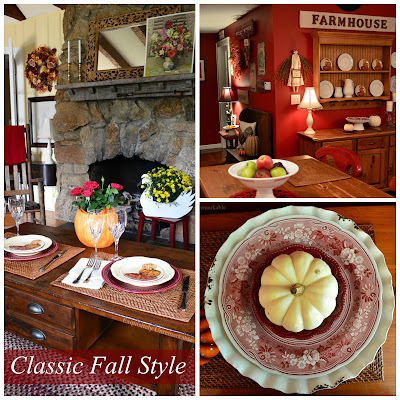 I love how you've incorporated fall into your home, despite the hot weather! (I know how you feel; it's been very un-fall-like here in NC.) I'm crushing on those cutting boards -- I definitely want to check out the tutorial for how to make my own. I am a northeast girl and definitely not used such high temps in late September and October, but that’s ok…it’s better than snow! 😉 Thanks so much for the kind words and the visit. I hope you have a great week! Love your little white creamers . . . I have fun collecting them . . Looking like fall is “moving in” . .. Happening a bit here too . . . Thanks so much, Maria. Your comment just made me smile from ear to ear. ❤️ And yes, I’m holding off on the mums for now. My petunias are still blooming like crazy…and I’m not complaining! Happy fall! I'm all about keeping things simple this year, but it's still a struggle for me. lol All of the fall touches that you've added to your home are so, so pretty! Thanks so much, Suzy! I have been working on simplifying, but one trip to HomeGoods can throw that plan all off, trust me! Thanks for the visit! Beautiful Fall decor ideas - it can be a challenge to refresh a home's decor every season but you seem to have perfected the art! Thanks so much. It's all about keeping it simple. Your simple décor is perfect and looks great. Those roses are gorgeous! I change my Fall décor up every year and then don't remember what I did from year to year. It's always a surprise. I just took the summer off my front porch today! I do the same thing. Years ago, I used to take pictures just to remind myself, if I really liked something. Now I have the blog! No more surprises! Kim your home looks so welcoming and cosy!! Love all of your sweet vignettes and your flowers are simply stunning!! Thanks so much, Sam! The roses have been a nice treat! Kim, I enjoyed your tour! I LOVED your banner!!!! And also I LOVE LOVE LOVE your family room....so pretty. I love the red accents and everything else about it. This weekend when I have more time I'll visit some of the other blogs on the tour. Thanks so much! I do love my banners! I can't seem to let a season go by without making one. So very beautiful, Kim! I love everything especially the crates. So inspiring and perfect fall decor! Thanks so much! I do love those crates. I can't believe they were free!! Your roses are so beautiful, Kim, I couldn't wait to stop over and their were more! Your home is so beautiful. Thank you so much, Julie! I am usually more of a tulip girl, but at these prices it's roses in every room! Thanks for the sweet words! Thanks Pam! I am still hanging on to the last bits of warm weather, but you're right...it's coming! Thanks for the visit! We also had 90 degrees all of last week. I just got into pumpkin mode. ;-) I shared my jack be little's on IG. I always think about you when I buy my flowers, Carla. I would much prefer to be getting them from you! I saw your jack...adorable! I must be hallucinating! $4 for flowers? Sign me up! Ahhhhhhhhhhhhh your living room is absolutely perfect!!!! We get the low priced bundles of roses here in our grocery store. I will think of you every time I buy a sweet bouquet!!! Oh J, you truly are the sweetest! Thank you! And now I will be thinking of you when I grab my own bargain bouquets! Kindred grocery store spirits!! You make me want to run out and buy some roses! Thank you, Stacy…and at $4 a bouquet, I say go for it! Kim, I llllllllllove your beautiful roses!!! You live in a great house. Kisses, my friend. Thank you, Mia! They were such a bargain, I couldn't resist! Love those crates. What a find. Curbside is even better than thrift store. Looking forward to seeing what you did to age them. Your house looks great. Thanks so much, Lorri! I love those crates, too. I have a secret to share about them...soon!! Have a great weekend. Beautiful!! I love all you did in decorating for Autumn!! Gorgeous roses! 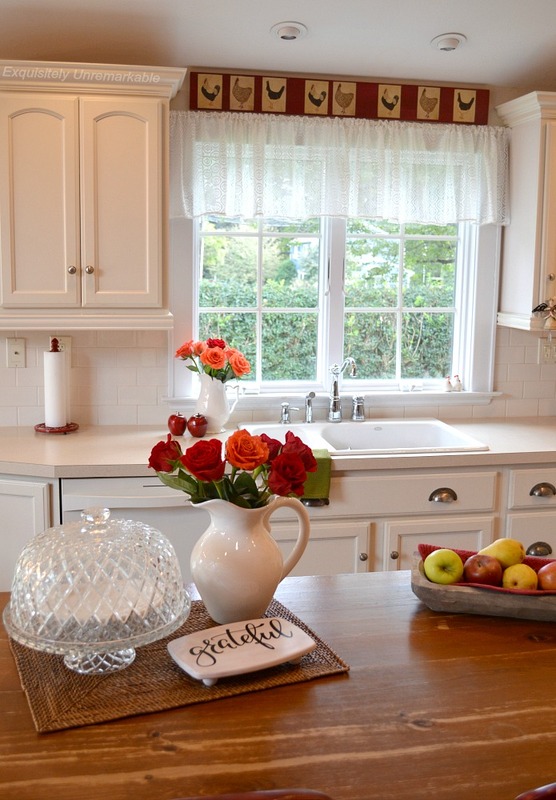 Love your white kitchen and I do hope for a white kitchen someday in the future. We live in a parsonage so I must accept things as they are till we retire then we will have things more like we like (white!) You take good care of your house! Happy and peaceful Autumn to you!! Thanks so much, Angela! My good friend has lived in parsonages all of her married life and has always yearned to renovate and decorate her own way. They finally bought a condo, for retirement, and she's been having a ball...so I get it! Happy Autumn to you and happy weekend as well! Your home is so cozy Kim, I especially love the repurposed crates, and your ceiling blade decor ties it all together beautifully. Happy fall! Thank you, Marilyn. I love those crates, too...major score, for free! Happy fall! Hi Kim, I love how you make your house looks so pretty with the flowers, and handmade crafts. I love that cute banner you made too! It seems we are back to summer mode here. I'm not complaining though as very soon it will be cold! Take care and have a nice day and weekend. Love that you are keeping it simple this fall. It still looks beautiful and plenty cozy! Thanks for sharing. Thanks, Carrie. I love simple...thanks for the visit! It seems I am once again playing "catch up" with some of my favorite blog friends. 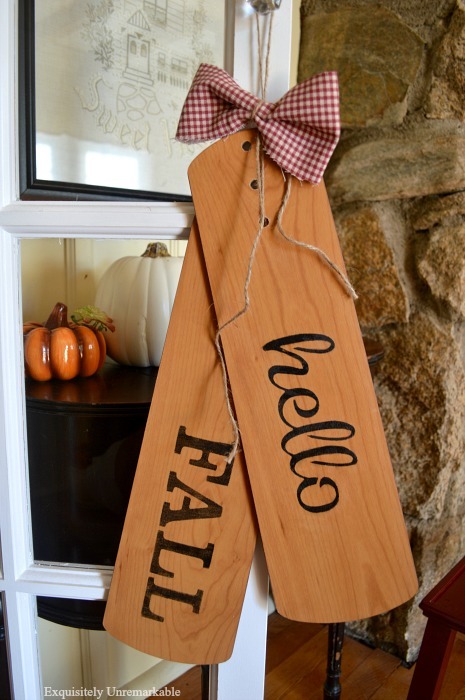 I really enjoy seeing what you've been up to, and I think your Fall decor is perfect for your cottage-style. I never have very good luck with cut roses lasting for more than a day or two, but yours always look so pretty. You make the cutest banners, and the recycled fan blades are adorable! Hope you are having a great week, Kim! Thanks so much, Carol! It's funny, I don't really do well with cut roses either, but it seems like these cheap ones are pretty hardy. Even better...Have a great weekend! $4? Is that a typo? No? I honestly need to shop at your supermarket. But I guess that's not possible. Do love your decor. Your cottage is so charming. Hugs. Not a typo, but crazy right? Roses used to be so out of reach, but for this price, I am a rose junkie! And thank you, Nancy, for the sweet words. Hugs!